Do you own Amish furniture? There are many hundreds if not thousands of Amish furniture craftsmen across America. They make bedroom sets, cabinets, children’s pieces, patio furniture, and on and on. I’ve been lucky to spend a good bit of time in and around their shops. This past trip, I visited everything from a one-man operation running on belt and pulley power, to a 180-man factory driven by automated CNC technology. I don’t have as much experience owning the things they make, however (mostly due to my floor space, and semi-nomadic existence, though I do enjoy a particular hickory rocker from time to time). So I wanted to ask you: do you own Amish furniture? What exactly? What has your experience–finding it, buying it, getting it delivered/installed (not to mention enjoying it)–been like? 52 responses to Do you own Amish furniture? Kitchen table w/ 6 chairs. Farmer/missionary style. My husband knew the people (Bloomfield,IA- home of people who got us together in first place) but family has since moved out of state. Definately better quality than Walmart! Mark chose to start our housekeeping with this set. Hickory rocker. It was wedding/goodbye/thank you gift from employee. Yup, I worked part time for a time for this family in Michigan. They have since expanded and divided up the business among local communities in order to keep it a true family business level. In fact, I helped finish off this rocker without knowing it at the moment! It is still going strong after 8 years, nothing loose except one piece of bark on seat slat. Two bar stools from same former employee. We need to order another one for our new daughter to be picked up when we go visit our relatives this fall (nobody in either our families are Amish). I do not own any Amish made furniture at this time but there are several pieces I would love to buy when I have the money. They are beautiful pieces of furniture and I would much rather buy local made than something shipped in from China. We own two bedside tables and a bookcase. They are sturdy and beautiful. Each bedside table has 3 drawers, which glide open and shut like magic. I have a beautiful bedroom set with two bedside tables. Bought it in MN. from the Amish there. It was shipped to me in AZ. Came in great condition. Was a bit hard to get up the stairs, as the dresser is so heavy. The dresser is actually two pieces, and is large like an entertainment center. I have enjoyed this set the past 7 years. I hope to buy a highchair for upcoming grandchild, and maybe a crib from them. Will get it from the Amish either in CO. or Indiana. I only have an end table in our bedroom, with drawer & cabinet. We bought it at an auction for the Amish schools in Bowling Green, Mo. It was from a local furniture maker there. The auction was great because it was cheaper but still new. The only reason we didn’t buy more was because we had a mini van and had no room. The quality is the BEST – and like Lee Ann said, it’s heavy. The maker told us when he sells to shops (that sell Amish furniture), they have a 100% mark up so if you can buy direct or from an auction, that sounds like a good place to start. My wife and I have a complete bedroom set, kitchen table and chairs (shaker style ladder back chairs & expandable 8′ table), and living room coffee and end tables. All are of top quality and well built(with dove tail,joints). I know they will last forever and be passed on to our children. I have a living room end table and two trestle benches to match a previously bought table. The quality is amazing compared to what is out there in the stores. Someday I hope to have a bedroom set. We got the end table via eBay, and the benches from a shop in Holmes county. I happened to be there and ordered it and then instead of having them ship, we drove back (4 hours away) to pick them up when they were ready. A rocking chair. Very sturdy and attractive. Yes, but only one piece. It is a coffee table. The legs/frame are sassafras limbs and the top is oak, cut into the shape of a fish! There was also a matching end table that I’m kicking myself for not buying at the same time because when I returned to the shop the following week, it was gone. We purchased it from a furniture dealer in Virginia who got it from an Amish manufacturer in Indiana. Everyone who sees it, loves it! I wish I could post a picture. We have an Amish furniture store here in Virginia Beach and their items are truly works of art and worth every penny plus more than you’d pay for them. We also like visiting the furniture stores in Lancaster County. One of my favorites is Peaceful Valley. My husband and I bought a kitchen table with 4 chairs. The table has two leafs with it. Claw footed table. Amish Made. We bought it second hand from a couple who had bought it directly from a store who carries Amish made furniture. They had it many years before we bought it from them. It is beautiful and still looks new. We have had it now for 2 years. We love it. I don’t have any yet:-( The one store the sells Amish furniture out here in Washington is really expensive and it would be just as expensive if we ordered it and had it shipped. Someday, when I have my dream house, I’ve already got my kitchen cabinets picked out from an Amish workshop in Michigan. Hopefully they will still be in business because this will be YEARS down the road! Christina sounds like you need to entice some Amish settlers out to Washington! I’m enjoying these responses (Robin I’ve never seen an Amish-made fish table!). I’m also curious–why did people choose to buy Amish furniture, rather than the alternatives? Was it quality? Price? Something else? Eric … it is a most awesome table!! We bought it because of style and quality. Amish furniture can be expensive but when you consider the workmanship, materials and time put into each peice, then it makes perfect sense. These pieces are investments … is there a way I can take a picture of my table to share? That would be great Robin–either you can send it to me at ewesner (at) gmail.com, or if you are on Facebook you can post it there on the Amish America page. So far we just bought a coffee table, which the top of it raises to dine at if you need extra dining seating-and two end tables. They do such beautiful work, hear that all the time in my area. We bought a porch swing made by the Amish about twelve years ago. It swings just like the old time ones on my grandmother’s porches. It has heavy metal where it should be, and still looks just great. When my first grandchild was born, I bought a cherry rocker for my daughter’s home and the exact same one for my home. It was definitely not cheaper…excellent quality and workmanship; but rather expensive. Then, when we built one of our homes in 1994, an Amish gentleman from Montgomery, IN, built all of our kitchen, bathrooms and utility room cabinets. Those cabinets were solid maple and were really well made. His prices were much better than the same amount of cabinets from a local cabinet company whose cabinets weren’t even custom but factory made. Their estimate on our entire cabinets was $15,000. Mr. Knepp’s price for all the cabinets, plus a table with 2 leaves, 6 chairs and 3 barstools was $7200. Amazing!!! Wow, that is a real deal. I’m wondering how people have found Amish furniture price-wise. I have seen examples where there are bargains, but in other cases I think you pay for the quality. Many Amish shops don’t have the same overhead though so that helps. Robin, I enjoyed “eyeing” your fish table on the AA Facebook page~! It’s a nice inviting piece. We have a jelly cabinet made by Kansas Amish near Yoder. We have had it for over 30 years now, and it is still one of our favorite pieces. We don’t own any Amish furniture … yet. However, all of our lawn furniture was made of local eastern red cedar by an old German (local) craftsman, who has unfortunately passed on. It is well made stuff & we enjoy it (whenever it is not 10,000 degrees outside as it has been all summer here this year). So I understand the diff between store bought junk & something that was made with pride. When we build our retirement home I am thinking Amish cabinets all the way. I built our cabinets in our exisiting home some 25 years ago or so and they have held up great; I am just not up to doing that much work again. So the next best thing is something from an Amish shop. Possibly some other pieces as well, like maybe some serving carts for the kitchen. I had been thinking Oklahoma for retirement, but last week was in Springfield, Mo and it was so beautiful that I left thinking about that area as a possible retirement destination instead. A big plus it hat it is only 30 miles or so to the large Amish community of Seymour, Mo. Hmmmm, wonder if they have a cabinet/ furniture maker in their community? I’m no expert but I find cedar to be fantastic wood, it has always been one of my favorites. Part of that has to do with the smell and also the color. If you do opt for Seymour, MO as a retirement area, I wouldn’t be surprised if you’d find an Amish furniture and/or cabinet maker, especially given the size of that community. It’t true that Seymour is a more conservative group, and the more conservative Amish tend to be more often involved in the “lower end” of wood processing–sawmills, pallet shops–but you definitely find some woodworkers in these communities too. I actually just checked a neat new woodworker’s guide I picked up in Indiana for Missouri craftsmen, and didn’t see anyone, but it is not yet comprehensive (just launched this year), so they don’t seem to have a Missouri section yet. Maybe someone who reads this comment can let us know. Really should read these bofore posting ..
It’s been so long since we bought our kitchen table & chairs (oak) bought 22 years ago from a shop I’m pretty sure sold Amish furniture. We wanted solid wood. I have bee saving up for an Amish hickory bent rocker for over a year. I hope to get it by Christmas this year, to rock my baby granddaughter (about a week shy of 6 months old, now). I want it especially since the Amishman who makes it also signs it—so, it’s more a work of art to me (that’s the sme reason why I like to collect textiles, like doilies, hankies, aprons—homemade items. I like to feel the connection with the person who produced the item. It’s more special than run of the mill “off the rack” items (it has “soul”). I wish I could readily afford more, since it is pricey (but worth it). Hickory rockers are one of my Amish furniture favorites–it’s something that can go inside or out, and I always marvel at how comfortable you can get wood to feel. I wish I did own an Amish piece, but I don’t. My uncle made his living as a carpenter and makes things out of wood in his retirement. We have a bowl he crafted from a chunk of tree complete with an interesting looking knot in it. It is interesting to me that well made pieces last forever. A local family has a piece of clothing that belonged to their locally famous ancestor that dates back to a very least 1815. I can’t imagine a pair of pants lasting that long, honestly. PS, have you ever heard of the Amish being “picked” for their own antiques or handy-work by people who buy and sell old stuff like on television programs like “American Pickers”? Incidentally I quite enjoy American Pickers, one of the better shows on the History Channel. I don’t know how often the Amish get “picked”, but for furniture and heirloom-type stuff, I think you could do pretty well. Eric, I sure wish we did have an Amish community(ies) in WA! Reason for buying Amish Furniture? Quality, price, made in USA, and I enjoy working with and talking to the Amish craftmen. As for the fireplaces that are advertised as being Amish, the wood part is Amish…..the rest is not…probably from China. I don’t mind so much buying things from China, but there is obviously an unbalance in trade practices. Wish they would buy more of our stuff….maybe Amish furniture? Bob that’s an interesting comment, on my recent trip I spoke with a few Amish who deal in wood…they said that a lot of their product is going overseas to China in fact–more of the raw materials than the finished goods. I think Asian demand is actually helping a lot of these guys stay afloat, especially with the down housing market in the US. Maybe the Amish furniture industry needs to band together for an Asian Marketing campaign? 🙂 I imagine they could do well in Japan, where Amish are fairly well-known already. After having Sunday dinner at the home of an Amish friend, I really wanted the same kind of table she had. It has 10 leaves in a free-standing cabinet and can expand from 4 feet to 24 feet! She said her cousin made it and had a shop where I could purchase one. I went to the shop and explained what I wanted. The owner had a photo album of different legs and woods and stains, and I picked what I liked. He said it would be $625, but he couldn’t make it immediately because it was wedding season (November), so his shop was backed up in production. Nevertheless, he called two weeks later to say it was done and that there was a change in price. I braced myself. He said that cherry-faced plywood had dropped in price, and it would actually be $595. Just this year, I had an Amish cabinet maker make three identical chests of drawers for us. I have known him for years and had admired the craftsmanship of the furniture in his showroom, but it was all too fancy for me. I had to cut photos out of magazines to show him exactly what I wanted, and even then, I got three phone calls during the building as he questioned various design elements. I ended up with three nearly Shaker chests in cherry that I adore. I find that with a lot of the smaller custom shops, they are often backed up–I remember one place that had even a 2-year wait. Several years ago we went to Lancaster. I was in search of a new Bed. I found an Oak Queen Bed. We broght it home. The following year we brought back a tall Dresser and night stand to go with the Bed. The next year we got 2 end tables. I love the quality of the pieces I bought. We looked at several stores in the area and settled on one that actually has 3 stores in the area. If I were looking for furniture I would definately make a trip to Lancaster. We live in Maine so it’s quite a trip. How do you decide which Amish furniture shop to buy from? 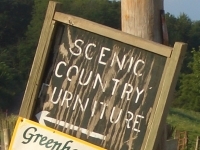 Again, appreciate all the great responses–one thing I’ve always wondered, from a consumer standpoint–when people go to an area with a lot of Amish furniture makers like Lancaster or Holmes County, how do you decide which shop to patronize? Do you go by recommendation, price, or do you visit a number of places and go by “feel”? Or sth else maybe? We have several pieces of Amish furniture: An end table, a television stand (I somehow find that ironic, but I like it! ), 2 rockers (one inside of wood and one outside of “plastic” wood), our sofa, and in my wife’s home office 2 file cabinets and her desk. We buy from the Amish because the furniture is better made, by buying from them we are supporting a lifestyle we admire, the whole spiritual concept behind their craftsmanship (kind of like the Shaker “hands to work, hearst to God” maxim), and we are supporting a small business made here. We have bought our furniture from individual Amish and through “Amish Direct Furniture”, a local business (also on the internet)that acts as a clearing house for several Amish woodworking shops. Amish furniture is slightly pricier than furniture from a chain or big box retailer, but you are buying a heirloom that will be passed down to future generations. Amish-made means solid wood (usually not veneer) and attenton to detail in well-made furniture. Currently, I am drooling over a gorgeous dining table(cherrywood with inlays) seating 6 that I saw in Shipshewana, Indiana a couple of months ago. I’d like to purchase it for my son when he gets his first apartment, so I’ve starting saving my pennies. I have 3 end tables, a sofa table and an entertainment center that I purchased from the Ohio Amish, in Berlin and Kidron, and I also have a cedar chest that I purchased at an Amish furniture store in Milroy, IN. I particularly like it because it’s solid wood and the finish and workmanship but the cheap American furniture to shame. My sister and I made a trip to Ohio and she ordered several pieces of furniture in Cherry and then we went back and picked them up, they were beautiful. I didn’t think their prices were out of line at all for what I was getting. Need to make another trip for a headboard for my bed. We have an Amish bedroom set and I love it. It is beautiful, functional and sturdy. Set consists of a dresser with mirror, a bureau, head and foot boards and two nightstands. It makes me so happy to use it and to know that while it was a bit of an investment, it is likely to be the only furniture set I will ever need. I have a queen bed, and 3 beautiful end tables mission style. I bought them from a local “English store” which has wicked markups. The furniture is top notch BUT……does anyone know how to buy direct from Amish builders? The “English” really add huge markups (I think). Bob if you are buying online there is probably going to be a markup since a non-Amish party is usually involved. Are you near an Amish community of any size? Going straight to a shop which sells retail may be your best bet…a lot do work exclusively on a wholesale basis, thought certainly not all. I own an eastern-Ohio Amish-made tall secretary. It has been in my family for four generations at least – going back to my mother’s grandfather. A cabinet maker I hired who has an obsession for this stuff took a look at it and told me it is likely turn of the century (18’s to 19’s). I don’t know when we got it. It has been a bit of a centerpiece; I even had it in my bedroom to use as a desk in high school ( a looong time ago ). I guess what’s cool – besides the booked veneers and the general look of it – is that it has all it’s original hardware, sliders, felts, and I even have the key. It’s probably the coolest piece of furniture I own, and still a centerpiece in my house. I don’t own any yet, but I’m considering buying some. I need a custom entertainment center for my house. I can’t find anything that meets my needs (it needs to be taller than typical and can’t be over a certain width). Looking for custom furniture, it looks like it is all Amish furniture. The fact that Amish furniture has a reputation of quality is a plus as I don’t want something low quality. Any tips on how you order custom Amish furniture? There are a couple of stores in Houston you can order from, but I’m sure it would be way cheaper to deal directly with an Amish furniture maker. However, I have no idea how that could be done. Anything to watch out for if I do go through one of the local stores that work with Amish manufacturers elsewhere? Leave a reply to Do you own Amish furniture?